This book focuses on the use of various predictive or condition-based maintenance tools and methods intended to highlight the loss of electrical energy in industry. Both practitioners and non-practitioners interested in internal cost reduction strategies, as well as energy managers and maintenance practitioners looking for new ways to save costs without large capital outlay will find this book an essential reference. The author has broad experience as a consultant to industry and is an editor for Plant Engineering magazine. 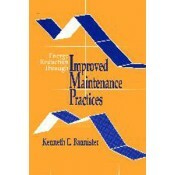 Offers easy-to-read, practical guidelines on how to reduce energy costs by improving the maintenance process. Examines how ineffective maintenance practices adversely affect energy consumption. Suggests practical strategies and solutions to use in overcoming inefficiencies. Calculates energy savings supported with actual case studies in each section. Lubrication. Compressed Air Systems. Electrical Connectivity. Mechanical Drive Transmission Systems. Waste Heat and Cooling Recovery. Housekeeping. P.M. Practices. Index of Figures. Glossary of Terms. Index. Suggested Reading.